Transitioning to a low-carbon circular economy and turning London into a smart digital city are just two of the overall objectives included in the Mayor of London’s draft London Environment Strategy, in which the issue of waste is given a prominent role. Mayor of London Sadiq Khan released the draft strategy on Friday (11 August), detailing his plans for the future of London’s environment, including aims that by 2026 no biodegradable or recyclable waste will be sent to landfill, and by 2030 65 per cent of London’s municipal waste will be recycled. Achieving a low-carbon circular economy: implementing a closed-loop economic model whereby as much value is extracted from resources as possible. Inherent in this is the integration of environmental costs into economic indicators and the acknowledgement that it is often the less affluent who bear the brunt of problems caused by the lack of environmental planning. The potential benefits for London from a circular economy are significant, with 10,900 low-carbon businesses employing 192,000 people generating £30.4 billion in sales in 2014/15. Making London a smart digital city: using new technologies and smart data to increase connectivity and efficiency in public services. The use of smart technologies can help Londoners to make more informed decisions on matters to do with waste, water and energy, for example, and support the circular economy by keeping resources in full use for as long as possible. Investing in the capital’s green infrastructure and natural capital accounting: making full use of London’s green infrastructure in the forms of its parks, wetlands, trees and more to reduce the impacts of climate change and keep carbon out of the atmosphere. Investment in such infrastructure can improve air and water quality, reduce car dependency, improve biodiversity and increase walking and cycling. Further to this, the benefits brought by natural capital should be included in any financial assessment of the economic benefits of maintaining green infrastructure. Following the Healthy Streets model: putting in place a Healthy Streets Approach to ensure that human health and experience is at the heart of city planning. By evaluating individual streets against evidence-based Healthy Streets Indicators allows for improvements to be made at street level, coming together to create a better quality of life for all Londoners. The strategy dedicates a significant amount of attention to the issue of waste and resource use, something that has often been sidelined in government environment strategy. 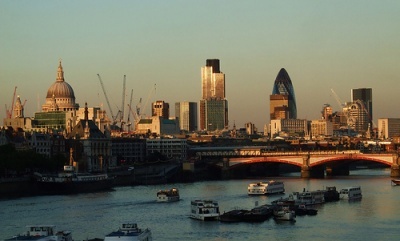 With only around half of the seven million tonnes of waste produced annually in the capital actually recycled (according to GLA figures, though the municipal recycling rate is in fact much lower), and current landfill capacity expected to run out by 2026, waste poses an ominous problem that London must address. The strategy’s key waste target is for London to become a zero waste city with a 65 per cent municipal waste recycling rate by 2030, within the range of recycling targets for 2030 currently being negotiated by the EU, a reduction in food waste produced per capita of 20 per cent by 2025, and non-recyclable waste going to provide heat and energy for homes and workplaces. ensuring there are sufficient sites to manage waste in London. The strategy will be supported financially and operationally by the London Waste and Recycling Board (LWARB). The organisation, which brings together London’s waste stakeholders and local authorities, will be given several briefs through the environment plan, including the management of a fund of £20.4 million between 2017 and 2020, working with waste authorities to improve recycling in blocks of flats, providing £6.4 million of funding between 2017 and 2020 through Resource London to help local authorities improve their recycling rates, and investing £7 million to assist the growth of circular economy businesses. Expectations for London’s waste authorities are also laid out in the strategy, with the strategy detailing what authorities must do to demonstrate compliance with the strategy’s waste management policies. These include: producing a waste management strategy, offering the Mayor’s minimum level of household recycling service provision, making best use of local waste sites, supporting the phasing out of fossil fuels, using Recycle for London messaging to increase recycling participation rates, demonstrating what positive policies they will put in place to improve recycling, publically notifying intentions to tender a waste contract, and procuring ‘green’ waste and recycling services. Added to this, Matthew Farrow, Executive Director at the Environmental Industries Commission, stated: “The draft London Environment Plan… is ambitious and comprehensive and we will be looking at the detail and responding to the proposals. The determination to address the full range of environmental issues is encouraging as is the ambition to go beyond legal requirements for example on recycling rates and particulate levels. “There are also some good examples of recognising the complexity and inter-connected nature of environmental challenges – such as the identification of schemes to simplify waste collection routes which also improves air quality. The Mayor’s office is inviting contributions to a series of consultations on the draft London Environment Strategy until 17 November. Individuals can respond to a number of surveys on different strategy areas, while organisations can respond to the Mayor of London survey with evidence and ideas. A route map to turn London into one of the world’s most resource efficient cities has been launched by LWARB, calling on stakeholders from local government to community groups to carry out a range of actions targeting five key areas including food waste and plastics. With European guidance still going through the bureaucratic process and national policy seemingly well down the pecking order, local and regional authorities can take the reins and steer their areas into a more circular way of living. Birmingham, Bristol, Manchester and central Scotland will each play host to Hubbub’s new boat made from 99 per cent recycled plastic, in order to raise awareness of growing levels of plastic pollution in the country’s waterways. Organisers of the Giro d’Italia are placing the focus on sustainability for the annual bike race, starting this May. The Quality Recognition Award winners were announced at the association’s Annual Lecture in London. Ecosurety and Hubbub have teamed up to produce a regular series of consumer awareness campaigns in order to boost recycling. Three quarters of the UK public want the government to ensure that businesses produce repairable and recyclable products, while 90 per cent believe that all packaging should be made recyclable, according to a new survey conducted by Cardiff University. Diageo, parent company of Guinness, Harp and Smithwick’s beers, has pledged to remove plastic rings from its multipacks of cans as part of a drive to reduce plastic waste. Dougie Sutherland has been appointed as CEO of Cory Riverside Energy after leaving ailing government contractor Interserve, which went into administration in March.